Saint Anthony Falls with the upper dam and lock, viewed from south-east; there is also a lower dam and lock further downstream. Apron by Ard Godfrey, et al. Today, the falls are defined by the locks and dams of the Upper Saint Anthony Falls, just downstream of the 3rd Avenue Bridge, and the Lower Saint Anthony Falls, just upstream of the I-35W Saint Anthony Falls Bridge. These locks were built as part of the Upper Mississippi River 9-Foot Navigation Project. The area around the falls is designated the St. Anthony Falls Historic District and features a 1.8-mile (2.9 km) self-guided walking trail with signs explaining the area's past. Before European exploration, the falls held cultural and spiritual significance for native tribes who frequented and lived in the area. The falls was an important and sacred site to the Mdewakanton Dakota and they called the Mississippi River, hahawakpa, "river of the falls". The falls (Haha) themselves were given specific names, mnirara "curling waters", owahmenah "falling waters", or owamni, "whirlpool" (mniyomni in the Eastern Dakota dialect and owamniyomni in the Teton Dakota (Lakota) dialect). Dakota associated the falls with legends and spirits, including Oanktehi, god of waters and evil, who lived beneath the falling water. The sacred falls also enters into their oral tradition by a story of a warrior's first wife who killed herself and their two children in anguish and forlorn love for the husband who had assumed a second wife. The rocky islet where the woman had pointed her canoe towards doom thus was named Spirit Island which was once a nesting ground for eagles that fed on fish below the falls. Dakota also camped on Nicollet Island upstream of the falls to fish and to tap the sugar maple trees. Since the cataract had to be portaged, the area became one of the natural resting and trade points along the Mississippi between Dakota and Anishinaabe peoples. The Anishinaabe (Ojibwe) term was recorded as "kakabikah" (gakaabikaa, "split rock" or more descriptively, gichi-gakaabikaa, "the great severed rock" which referenced the jagged chunks of limestone constantly eroding by the falls). In 1680, the falls became known to the Western world when they were observed and published in a journal by Father Louis Hennepin, a Catholic friar of Belgian birth, who also first published about Niagara Falls to the world's attention. Hennepin named them the Chutes de Saint-Antoine or the Falls of Saint Anthony after his patron saint, Anthony of Padua. Later explorers to document the falls include Jonathan Carver and Zebulon Montgomery Pike. Mississippi River at Minneapolis today, looking downstream. The bridge in the foreground is the Third Avenue Bridge, behind it are the Upper St Anthony Falls to the left and the upper lock and dam to the right, followed by the Stone Arch Bridge. The new I-35W Saint Anthony Falls Bridge can be seen in the background. Following the establishment of Fort Snelling in 1820, the falls became an attraction for tourists, writers and artists who sought inspiration even if Hennepin's descriptions were not as majestic as hoped for. By the 1860s, however, industrial waste had filled the area and marred the falls' majesty. Further competition over the power of the falls on both banks of the river led to its eventual downfall when it partially collapsed in 1869 and was reinforced and subsequently sealed by a concrete overflow spillway (or "apron"). The upper dam of St. Anthony Falls with upper lock on the left. The Third Avenue Bridge can be seen in the background. Photo taken in October 2005. The area around the river was added to the National Register of Historic Places as the Saint Anthony Falls Historic District in 1971 which includes 8th Avenue Northeast extending downstream to 6th Avenue Southeast and approximately two city blocks on both shoreline. The district's archaeological record is one of the most-endangered historic sites in Minnesota. The National Register of Historic Places is facilitated by the National Park Service. The national significance of the Saint Anthony Falls Historic District is a major reason why the National Park Service's Mississippi National River and Recreation Area was established along the Mississippi River in the Minneapolis – Saint Paul metropolitan area. For untold generations of Indian people the Mississippi River was an important canoe route. To pass around the falls, the Dakota (Sioux) and Ojibway (Chippewa) used a well-established portage trail. Starting at a landing below the site now occupied by the steam plant, the trail climbed the bluff to this spot. From here it followed the east bank along what is now Main Street to a point well above the falls. Geologists say that the falls first appeared roughly 12,000 years ago about 10 miles (16 km) downstream at the confluence of the glacial River Warren (at present-day Ft. Snelling). Estimates are that the falls were about 180 feet (55 m) high when the River Warren Falls receded past the confluence of the Mississippi River and the glacial River Warren. Over the succeeding 10,000 years, the falls moved upstream to its present location. The water churning at the bottom of the falls ate away at the soft sandstone, eventually breaking off the hard limestone cap in chunks as the falls receded. From its origins near Fort Snelling, St. Anthony Falls relocated upstream at a rate of about 4 feet (1.2 m) per year until it reached its present location in the early 19th century. Tributaries such as Minnehaha Creek begot their own waterfalls as the Mississippi River valley was cut into the landscape. When Father Louis Hennepin documented the falls he estimated the falls' height to be 50 or 60 feet (18 m). Later explorers described it as being in the range of 16 to 20 feet (6.1 m) high. The discrepancy may have been due to scope, as the current total drop in river level over the series of dams is 76 ft (23 m). The geological formation of the area consisted of a hard, thin layer of Platteville Formation, a limestone, overlaying the soft St. Peter Sandstone sub-surface. These layers were the result of an Ordovician Period sea which covered east-central Minnesota 500 million years ago. The first private land claim at the falls was made by Franklin Steele in 1838 — though he didn't obtain financing for development until 1847, in the form of $12,000 for a 9/10 stake in the property. On May 18, 1848 president Polk approved the claims made in St. Anthony, and Steele was able to build his dam on the east side of the river above the Falls, blocking the east channel. The dam extended diagonally into the river 700 feet (210 m), was 16 feet (4.9 m) high, and was secured to the limestone riverbed. Its thickness tapered from 40 wide at its base to 12 feet (3.7 m) wide at the top. Steele dispatched logging crews to the Crow Wing River in December 1847 to supply pine for the sawmill, and by September 1, 1848 sawing commenced using two up-down saws. He was able to sell the lumber readily, supplying construction projects in the booming town. The new community at the Falls attracted entrepreneurs from New England, many of whom had experience in lumber and milling. He had hired Ard Godfrey to help build and run the first commercial sawmill at the Falls. Godfrey knew the most efficient ways to use natural resources, like the falls, and the great pine forests, to make lumber products. Godfrey built the first home in St. Anthony, Steele had the town platted in 1849, and it incorporated in 1855. Sawmills over Saint Anthony Falls, ca. 1860. By 1854, 300 squatters occupied the west bank of the river, and in 1855 Congress recognized the squatters' right to purchase the land they had claimed. The west side quickly developed scores of new mills and consortia. They built a dam diagonally into the river to the north, which, along with Steele's dam created the inverted V-shape, still apparent today. Steele created the St. Anthony Falls Water Power Company in 1856 with three New York financiers, Davis, Gebhard and Sanford. The company struggled for several years, due to poor relations with the financiers, a depression, and the Civil War. In 1868 the firm reorganized with new officers including John Pillsbury, Richard and Samuel Chute, Sumner Farnham, and Frederick Butterfield. As Minneapolis (and its former neighbor across the river, St. Anthony) developed, the water power at the falls became a source of power for several industries. Water power was used by sawmills, textile mills, and flour mills. Millers on the Minneapolis side formed a consortium to extract power by diverting upper-level water into waterwheel-equipped vertical shafts (driven through the limestone bedrock into the soft, underlying sandstone) and then through horizontal tunnels to the falls' lower level. These shafts and tunnels weakened the limestone and its sandstone foundation, accelerating the falls' upriver erosion to 26 feet (7.9 m) per year between 1857 and 1868. The falls quickly approached the edge of their limestone cap; once the limestone had completely eroded away, the falls would degenerate into sandstone rapids unsuitable for waterpower. The mills on the St. Anthony (east) side of the river were less-well organized harnessing the power, and therefore industry developed at a slower pace on that side. The early dams built to harness the waterpower exposed the limestone to freezing and thawing forces, narrowed the channel, and increased damage from floods. A report in 1868 found that only eleven hundred feet of the limestone remained upstream, and if it were eroded away, the falls would turn into a rapids that would no longer be useful for waterpower. Meanwhile, the St. Anthony Falls Water Power Company approved a plan for the firm of William W. Eastman and John L. Merriam to build a tunnel under Hennepin and Nicollet Islands that would share the waterpower. This plan was met with disaster on October 5, 1869, when the limestone cap was breached. The leak turned into a torrent of water coming out the tunnel. The water blasted Hennepin Island, causing a 150-foot (46 m) chunk to fall off into the river. Believing that the mills and all the other industries around the falls would be ruined, hundreds of people rushed to view the impending disaster. Groups of volunteers started shoring up the gap by throwing trees and timber into the river, but that was ineffective. They then built a huge raft of timbers from the milling operations on Nicollet Island. This worked briefly, but also proved ineffective. A number of workers worked for months to build a dam that would funnel water away from the tunnel. The next year, an engineer from Lowell, Massachusetts, recommended completing a wooden apron, sealing the tunnel, and building low dams above the falls to avoid exposing the limestone to the weather. This work was assisted by the federal government, and was eventually completed in 1884. The federal government spent $615,000 on this effort, while the two cities spent $334,500. The concrete apron over St. Anthony Falls is engineered to produce the pronounced hydraulic jump evident in this photo. St. Anthony Falls was the upper limit of commercial navigation on the Mississippi until two dams and a series of locks were built between 1948 and 1963 by the United States Army Corps of Engineers. The locks made commercial navigation possible above Minneapolis but, since the locks in Minneapolis are smaller than most of the locks on the rest of the river, the practical limit for many commercial tows is further downriver. A smaller number of barges go to Minneapolis. At midnight on June 9, 2015, the Upper St. Anthony Falls lock was permanently closed by Section 2010 of "H.R.3080 - Water Resources Reform and Development Act of 2014" which was signed into law by President Barack Obama on June 10, 2014, and was required to be implemented "Not later than 1 year after the date of enactment" The closure is intended to stop the spread of invasive species, namely two types of Asian carp: bighead carp and silver carp. Minneapolis is once again the site of the head of navigation of the river. Completed in 1963, the Upper St. Anthony Falls Dam is a horseshoe-shaped hydro-electric dam 49 feet (15 m) in height. The upper pool has a normal capacity of 3,150 acre feet (3,890,000 m3) and a normal level of 799 feet (244 m) above sea level. The navigation channel required alteration of the historic Stone Arch Bridge, which now has a metal truss section to allow ships to pass below. Completed in 1956, the Lower St. Anthony Falls Dam is a gravity-type hydro-electric dam 26 feet (7.9 m) in height, consisting of a 275-foot (84 m) long concrete spillway with four tainter gates. The lower pool (sometimes called the intermediate pool) has a normal capacity of 375 acre feet (463,000 m3) and a normal level of 750 feet (229 m) above sea level. The pool below the lower dam has a normal level of 725 feet (221 m) above sea level. The upper and lower locks are each 56 feet (17 m) wide by 400 feet (120 m) long. The current around the spillway/falls is often swift and dangerous. In 1991, a small boat drifted too close and fell over one part of the dam. One person on board was killed, and one had to be rescued by helicopter. Rescues at the site are usually much less dramatic, but continue to happen occasionally. Panoramic photo from the new Water Power Park, visible from this vantage: the lower portion of Saint Anthony Falls; the concrete wall on the far side of the falls is part of the locks to allow ships to pass the waterfall; to the left is the Stone Arch Bridge, above it is the Guthrie Theater; to the right of the Guthrie are the white silos and reconstructed shell of the former Washburn "A" Mill, now the Mill City Museum; to the right of the museum are a series of redeveloped flour and grain mills making up a significant portion of the city's Mills District. The Falls of Saint Anthony, Alto Mississippi, Henry Lewis, 1847. Thyssen-Bornemisza Museum. The Falls of Saint Anthony, George Catlin, 1871. Thyssen-Bornemisza Museum. ^ National Park Service (2006-03-15). "National Register Information System". National Register of Historic Places. National Park Service. ^ "St. Paul District > Missions > Navigation > Locks & Dams > Upper St. Anthony Falls". www.mvp.usace.army.mil. ^ "Mill City Museum History of St Anthony". Mill City Museum. 2005. Archived from the original on 2007-05-13. 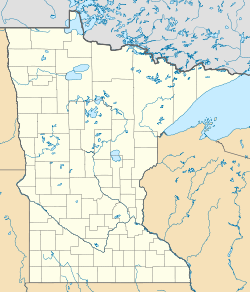 ^ "St. Paul District > Missions > Navigation > Locks & Dams > Lower St. Anthony Falls". www.mvp.usace.army.mil. ^ "St. Anthony Falls Historic District". City of Minneapolis. 2006. ^ a b "Recipe for a Mill City, A Curriculum Kit for Minneapolis Third Grade Students" (PDF). Minnesota Historical Society. 2002. Archived from the original (PDF) on 2008-06-25. ^ a b c d e "Engineering the Falls: The Corps Role at St. Anthony Falls". U.S. Corp. of Engineers. Archived from the original on 2012-02-05. Retrieved 2007-05-18. ^ Charles M. Skinner (1896). "FALLS OF ST. ANTHONY: Myths and Legends of our Own Land". sacred-texts.com. ^ "Twelve Thousand Years Ago". St. Anthony Falls Heritage Board. 2007. ^ Susu Jeffrey (2000). "Preserve Camp Coldwater Coalition". ^ a b "A History of Minneapolis". Minneapolis Public Library. Archived from the original on 2007-04-20. Retrieved 2007-05-18. ^ Serge Jodra (2004). "L'exploration de l'Amérique du Nord". ^ Engineering the Falls: The Corps Role at St. Anthony Falls Archived 2012-02-05 at the Wayback Machine - an article on the U.S. Army Corps of Engineers website covering the history and geology of St. Anthony Falls. ^ "10 Most Endangered Places". Preservation Alliance of Minnesota. 2008. Retrieved 2018-01-20. ^ "A History of Saint Anthony Falls". 2014-07-14. ^ Anfinson, Scott (1989). "Archaeology of the central minneapolis riverfront". The Institute for Minnesota Archaeology. Retrieved 2007-05-08. ^ a b "St. Anthony Falls:Timber, Flour, and Electricity" (PDF). National Park Service. Retrieved 2007-05-29. ^ "1838: Franklin Steele claims land at the Falls". Timeline. Minnesota Historical Society. Retrieved 2007-05-29. ^ "History of the Minneapolis Riverfront District and vicinity". Bridges. Minneapolis Riverfront District. Archived from the original on 2007-06-20. Retrieved 2007-05-29. ^ "Old St. Anthony". Mississippi River Design Initiative. University of Minnesota. Archived from the original on 2007-06-28. Retrieved 2007-05-29. ^ Kane, Lucile M. (1987) . The Falls of St. Anthony: The Waterfall That Built Minneapolis. St. Paul, Minnesota: Minnesota Historical Society. ^ Pennefeather, Shannon M. (2003). Mill City: A Visual History of the Minneapolis Mill District. St. Paul, Minnesota: Minnesota Historical Society. ^ "H.R.3080 - Water Resources Reform and Development Act of 2014". congress.gov. Retrieved 9 June 2015. ^ "President Obama approves closure of Upper St. Anthony Falls lock". hometownsource.com. Retrieved 9 June 2015. ^ "Upper St. Anthony Falls Lock Closing To Stop Invasive Carp". minnesota.cbslocal.com. Retrieved 10 June 2015. ^ "Upper St. Anthony lock closing after half a century; blame the carp". mprnews.org. Retrieved 10 June 2015. ^ "Upper St. Anthony Falls Lock Closure". US Army Corps of Engineers. 2015. Archived from the original on 2015-06-10. This page was last edited on 1 January 2019, at 23:33 (UTC).